I’m an active traveler, but I have never claimed to be in the best shape. My lack of fitness stamina never usually limits my adventures though and I’m almost always willing to try anything once. I’ve hiked Kings Canyon, the Koloiki Trail and countless other physically demanding, outdoorsy activities. That’s why when I saw the description for the volcano hike in St. Kitts, I wasn’t too worried. As a guest of the St. Kitts Marriott Resort, vacationers have a wide variety of activity options which the hotel can help arrange. Tours to Brimstone, the UNESCO site, ATV excursions or exploring the capital city Basseterre are all great options for travelers to this idyllic island. 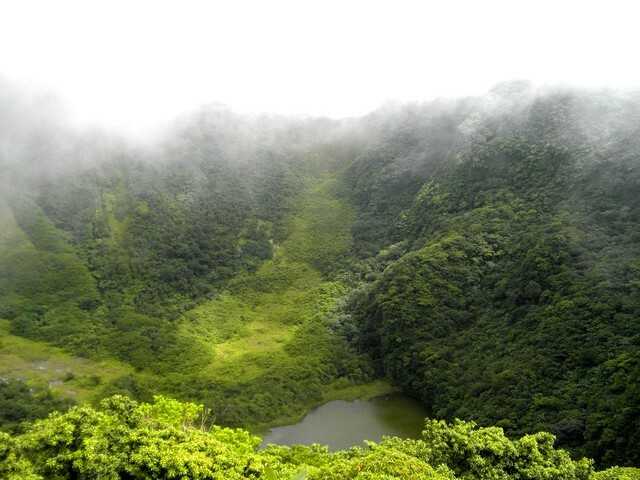 There is also the opportunity to hike the highest peak on St. Kitts, Mount Liamuiga. The volcano towers above the island an astonishing 3,792 feet and is one of the highest peaks in the Caribbean. Mount Liamuiga is largely dormant, although there are some unverified reports that it erupted in the 19th century. It’s of a curious coincidence that the old name for the gassy peak was Mount Misery, a much more fitting name in my opinion. While at first blush it may seem intimidating, it’s been my experience that most extreme activities come with a similar warning. It’s to make sure people who shouldn’t participate don’t, but I’ve never had a problem enjoying even the activities with the most dire of warnings. Until St. Kitts. O’Neil Mulraine, our trek guide, picked us from the St. Kitts Marriott, who sponsored my trip, and we drove the short distance to the base of the volcano and the start of a dense rainforest. At first it was very pleasant. We enjoyed walking through the dense foliage and stopped often to admire native plants and listen for the sound of green vervet monkeys in the distance. Then we started to ascend. Hiking up the volcano wasn’t easy, I’m not going to lie. It was steep and loose rock, mud and massive tree roots peppered the path. But it wasn’t THAT bad. The ascent took two hours, and I remember wondering along the way how were we going to get down. Surely there was another path, surely we wouldn’t return down the same, hard to navigate path that would be next to impossible to tackle going downhill. Surely. Finally, we were there, we were at the peak of the mighty volcano. We shimmied along a cliff face with not much below us other than a massive fall, and found a seat on some rocks overlooking the vibrant green caldera of the old volcano. And my jaw dropped. 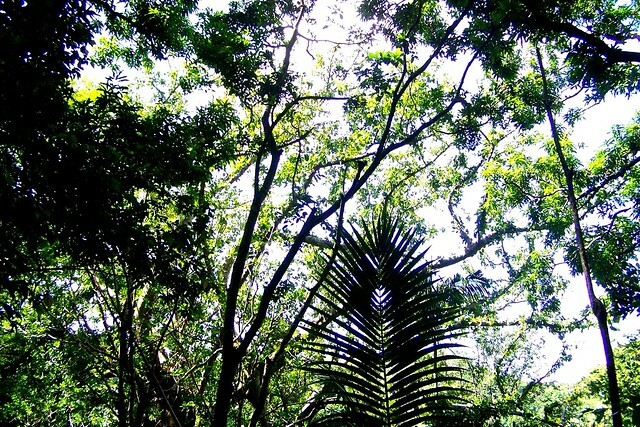 A dense, intensely green canopy sprawled across, covering everything in sight. It was stunning. We were so high up that clouds were drifting past, creating an otherworldly feel to the whole experience. Behind us we could hear the chatter of mongoose fighting over a bit of food and somewhere in the distance a monkey called out. It was hard and I wasn’t happy with the hike, but what a payout. I sat there quietly, catching my breath and snacking on sandwiches content to watch the show nature had arranged for me. I didn’t want to leave. Not just because of the view, which was great, but because I didn’t want to climb back down the mountain. My legs were jelly and I seriously questioned my ability to make the trek. It took a long time, mostly because of me, but we somehow made it down the massive volcano. It wasn’t the cardiovascular exertions that killed me, it was the fact that my legs had been pushed to their limit. The two hour climb down was entirely downhill on hard to navigate paths fraught with hazards. I fell, I cursed and yes, I even broke my camera. (not on purpose) But I did it and I don’t think I’ve been as proud of myself in a long time. Many people visit St. Kitts and stay at the St. Kitts Marriott for the beaches and warm Caribbean sun, both of which are in clear abundance. But with a little effort, visitors can enjoy something else that is so unusual and remarkable, it’s hard to say you’ve visited St. Kitts without doing it. That’s why, even with all its physical exertions, the Mount Liamuiga climb is something everyone has to try at least once in their life. I hoped these green vervet’s didn’t strike the fear of God into you. I’ve seen those little bastards get pretty aggressive in the past. Lovely photos. You really know how to crush a working man’s soul don’t you? I prefer hiking up a treacherous stretch than going downhill and you now know why. The Grand Canyon is the same way. Although it is a tortuous hike up, it is much more awkward shimmying down. That is cool St. Kitts Marriot sponsored your trip. I have not seen many blogs about this area, so they are smart to get some PR out there. Thanks Ted! First, completely agree about the going down part, I nearly cried. And yes, the St Kitts Marriott (along with many others in the region) have been very forward-thinking when it comes to PR and getting their name out there. Not sure why you are complaining. As a youngster we actually climbed down into the volcano on vines. That was the hard part. Not climbing up and down the mountain. Hey Matt, not sure why I’m just seeing this post but it brought back some fond memories. The hike up the volcano was amazing, while I think I handled the effort okay, my partner in crime Erin did not. It was a little out of her activity range but somehow ONeil helped her up and down. I thought down was a lot harder, not only was it pouring down rain the entire time which turned out trail into a river, but you use less muscles, almost all quads on the way down. Yes, those legs were burning. I’m looking forward to a return trip to this beautiful island. Hi Matt, thanks for the memories. I climbed up and came down in the pouring rain, hanging onto muddy tree roots on the way down. My husband and I always liked adventures and knew we had to try this. Our legs turned to jelly and they stayed that way for a couple of day, where we hardly left our hotel. This climb was 20 yrs ago when we were both 50 yrs old. Hey it was worth it. I still work part time and one of my co workers ask me about this trip, which brought me to this website. Nevis was a wonderful island too. My husband and I just finished a Royal Caribbean cruise and I had the bright idea of climbing a volcano. How many people do I know have done that? And after this trip I know why. We started 3rd and 4th and ended last. But we finished. The hubby stayed right there to encourage me. I didn’t think I could do it, but I’m so proud of us that we finished. The view was beautiful but shirt since it started raining. My shorts I wore are probably ruined, the purse I took was filthy (yep I was silly enough to have a little purse with em), and we rested for a day and a half. But we did it. I would warn all, this is not a regular “strenuous” activity. Better to call it “extreme” or maybe “treacherous”. HELLO, I HAVE BEEN READING ALL THE COMMENTS ON THE VOLCANO HIKE. MY HUSBAND AND I ARE IN OUR FORTIES AND WE PLAN TO TAKE A CRUISE TO ST. KITTS IN SEPTEMBER OF THIS YEAR. WE ARE ALWAYS LOOKING FOR NEW & EXCITING THINGS TO TRY WHEN ON VACATION. I PERSONALLY THOUGHT THIS WOULD BE THE EXPERIENCE OF A LIFETIME. WHILE AT THE SAME TIME, I HAVE TO SAY I’M A BIT SKEPTICAL BECAUSE I DO HAVE ASTHMA AND WE PLAN TO VACATION THIS YEAR WITH OUR TWO KIDS ( AGES 11 AND 22 ) DO YOU THINK I WOULD BE WAAAY OUT OF MY LEAGUE TO TRY SOMETHING THIS EXTREME UNDER MY CIRCUMSTANCES? WHAT WOULD YOU DO? I’M TOTALLY UNDECIDED…HELP!!! First, all caps aren’t necessary. 🙂 Second, try it. The worst that happens is that you stop halfway and head back but at least you’d have tried. Thanks for your blog about Mt. Liamuiga. In our youth, my husband and I never shied away from an adventure, but as arthritis and age have made their arrival we take seriously a walk , a hike or other that we will regret during painful days afterwards. So, after reading about your experience we will definitely take the over 60 bus tour despite how much we want to be among the forest and the monkeys. Thanks for the beautiful photos and sound advice. Congrats to those of you who have done I did it when I was 15,and boy I found it hard….but it’s something you look up at and dream about getting there. For the person with asthma I think you should get your Doctor,s advice first as its stress on the heart. Good luck and if you do come to stkitts try it once you are physically fit it’s a wonderful experience. As youngsters we actually climbed down into and out of the volcano on vines. That is the hardest part. I had a similar experience. All being warned the night before by my husband who gently asked-Are you sure you want to do this?? As I have gone on other excursions-I figured how bad could it be?? As we made our way back down the mountain-that I was simultaneously cursing-not to mention wondering does my insurance cover airlifting off a mountain? My legs were like Jello-but the guide could not have been nicer! Put music on his I-phone-made me a walking stick-and assured me he would get me off the Mountain. needless to say-I survived-and am glad for the opportunity!